Defense Ministry reveals 15% increase in religious women enlisting in IDF through midrashot program. The Defense Ministry’s Social Security Division published data showing that there was a 15% increase in the number of girls enlisting in the IDF through the Midrashot program. 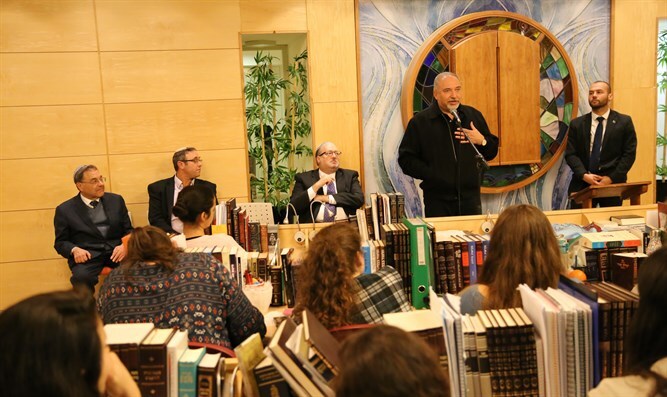 The head of the division, Deputy Director General of the Ministry of Defense Moshe Zin, presented the data at the launch of the academic year for midrasha girls who will be enlisting in the IDF. The increase in the number of girls who enlisted through the Midrasha track is also evident this year in the record for Midreshet Lindenbaum, which was the first to establish such a program combining Torah study with IDF recruitment, and which currently operates in Jerusalem and in two additional branches in Lod and Carmiel. About 95% of the girls in each Midreshet Lindenbaum graduating class go into the army and another 30% sign on for career service in the IDF, such that in the last class of about 100 girls, there are 21 female officers. According to the Defense Ministry’s Social Security Division, about 308 religious girls joined the army at the beginning of the year 5769, representing an increase of about 15% compared to last year, and of more than 100% compared to 2014.